Earlier this week, I wrote a few brief thoughts about each of the books I've read so far this year. It irritated me to not be able to link to some of the reviews (because they hadn't been written yet), so I'm remedying that this week. First up, the silliest book out of the three. 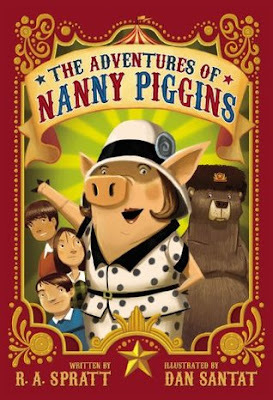 In my one-sentence summary, I described Nanny Piggins as "the most unorthodox of nannies," and she is that. For one, she's a pig babysitting human children, so there's the mayhem you might expect from crossing over cultures and, um, species. She enjoys eating (especially chocolate), getting dirty, and skipping school to go on adventures. She has absolutely zero regard for money, and, oh, did I mention she used to be part of a circus? As you might expect, the children (Derrick, Samantha, and Michael Green) think she is the best nanny ever; their father (if you can even call him that--he never demonstrates even a smidge of parental affection) can't stand her, but she's cheap, the cheapest nanny he's ever had, so he keeps her. After being disqualified from a self-portrait competition: "'But that's pigism,' bellowed Nanny Piggins. She was really cross now. 'How dare you stand up there and be piggist? In front of children too. You should be ashamed of yourself.'" After getting stranded in a boat in the middle of a downpour: "'Ahnyong,' Nanny Piggins called up to the two men. (This is how you say 'hello' in Korean.) Nanny Piggins may never have been to the seaside but she had spent many long nights playing backgammon with two Korean trapeze artists. And they had taught her enough Korean to buy a chicken, rent a motorbike, tell someone to be quiet in the cinema, and all the other things essential for day-to-day life." While trying to come up with a plan so Nanny Piggins won't have to return to the circus: "'I once had myself fired through an open window at the cinema just so I wouldn't have to pay for the ticket,' confessed Nanny Piggins. 'What are we going to do about the Ringmaster?' asked Derrick. 'Already?' exclaimed Michael, deeply impressed. 'Oh yes,' said Nanny Piggins. 'I can regale people with anecdotes from my sordid past and think at the same time.'" The author also occasionally breaks the fourth wall and addresses the reader directly, which I am always a fan of and which instantly increases the humor for me. The only negative thing about the book is that Nanny Piggins is downright naughty at times, and, well, if you don't appreciate the "responsible" adult being the naughtiest one in the book, this story might not be for you. For all others, it's quite the ride. A few years ago, Aaron and I met Liesl Shurtliff when she was in Salt Lake City for a book signing (for this book). At the time, we were in the middle of her first book, Rump, and so we bought Jack so we could read it when we were done. And we just now finally got to it. Jack is not an easy child to parent. He's not bad per se, but he still gets into a fair amount of trouble and likes to mercilessly tease his little sister. His mother doesn't know what to do with him. Then one day, his entire village, including his father, is swept up into the sky. Jack witnesses the whole thing: great booms coming from the sky, dirt falling from the clouds, and giants dropping down to earth. But his mother doesn't see it and thinks it is just another one of his far-fetched stories, which she doesn't appreciate at a tragic time like this. But Jack knows better, and he is desperate to get up to the land of the giants and save his father. My kids absolutely loved this book. 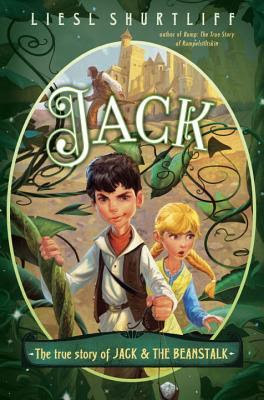 Jack is adventurous and brave and loyal, and, as I said with Rump, it was nice to read a fairy tale retelling with a boy protagonist. For my part, for whatever reason, the book felt long. I'm not sure what it was exactly because I thought the characters were great and the retelling was clever, but it felt tedious to read out loud. Instead of being anxious to return to it each day and willingly agreeing to read "just one more chapter," I found myself looking for excuses to cut our reading time a little short. I think what it comes down to is that my kids love a good story, and I love good writing. I love to read aloud books where it is a pleasure to say the sentences out loud because they're so well-crafted. That makes it sound like this one isn't well written, which isn't true. The writing is perfectly fine; it doesn't draw attention to itself in a bad way; it just doesn't sparkle. And I think I noticed it more in this book because it was a little bit longer than some of the books we've read recently, and I was ready to move on before it was over. But enough of that. My kids had no such reservations about it. They loved it from beginning to end, and after it was over, Max asked me to get the third one for him (the true story of Little Red Riding Hood) as a summer reading program prize. Which I happily did. It's dangerous for me to listen to the What Should I Read Next podcast because even when I'm not asking that question, I almost always come away with books I feel compelled to read right that second. A few months ago, one of her guests, Carolyn McCready, listed A Ring of Endless Light by Madeleine L'Engle as one of the books she loves. She and Anne talked about how much they love Madeleine L'Engle and about how she was such a prolific writer but readers don't always go beyond the Wrinkle in Time series. I certainly never did (in fact, I think I never read more than the first one in that series because, you know, sci-fi). But A Ring of Endless Light sounded different--like it was about a typical girl in a typical family, which was exactly the kind of series I would have loved as a teenager. I really wanted to read A Ring of Endless Light, but it's the fourth in the series, and I thought I better start with the first one. It's narrated by 12-year-old Vicky Austin. First-person novels can be a bit hit and miss for me because sometimes the narrator is just a touch too witty or clever, and I just can't buy it that anyone would talk or think like that in real life (unless they're British--I'll believe anything if they're British). But in this case, Vicky's voice was natural and authentic (read: not always eloquent but charming in its own right . . . and very convincing). Her family lives in a small town where her father is the community doctor and her mother is a homemaker. She has one older brother and also a younger sister and brother. Early on in the story, her parents take in 10-year-old Maggie after her father is tragically killed in a plane crash. Maggie has been spoiled all her life, a trait which, compounded with grief, makes her extremely difficult to live with. At first everyone in the family grits their teeth while silently hoping Maggie's grandfather will take her away soon, but after awhile other events, both happy and sad, bring them all together and make Maggie feel like a real part of the family. It had a very similar feel to some of my other favorite books when I was a teenager: the Melendy quartet by Elizabeth Enright, the Beany Malone series by Lenora Mattingly Weber, and the Betsy-Tacy series by Maud Hart Lovelace. Just a sweet, functional family with normal ups and downs, a few sibling squabbles, and a general feeling of contentment. Now my only problem is going to be finding time for the second and third in this series so I can actually read the book I set out to in the first place. 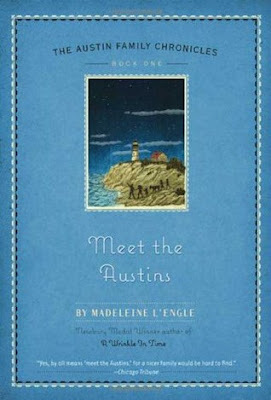 I was a big fan of all the Austin books when I was a kid, and even branched into her adult fiction as an adult. I was not afraid of the sci-fi :-). Haha! I'm willing to be adventurous! What is one of your favorite adult books by her?